Haupt Germany Tours - Just Click! Need to get away? You might want to try a stay at Mountain Lake Resort in Mountain Lake, VA (near Blacksburg, VA). It was once owned and operated by Brig. General Herman Haupt (from 1859 to 1891). This resort property provided the scenery for the movie "Dirty Dancing" in the fall of 1986. When in Windesheim, stay at the Gasthaus Stempel and tell Frau Stempel that I sent you. It is located at 33 Hauptstrasse in Windesheim. The rooms are very clean and modernized. There is a restaurant/tavern across the street (operated by the Stempels) that serves great local dishes and drink. Going to New York City? Be sure to visit the Enid A. Haupt Conservatory at the New York Botanical Garden in Bronx, NY. It was formerly known as the "Crystal Palace". Enid A. Haupt was the principal benefactor for its restoration. For Enid's Haupt connection see - Adolf Haupt of Hungary. Perhaps you are going to Washington, DC. Do not miss a stroll through the "Haupt Garden" in the Smithsonian Complex. The Garden is located just outside the "Old Castle" Building. These too are attributed to Enid A. Haupt. Are you ready to go to college? You may want to check out Transylvania University in Lexington, KY. The Haupt Humanities Building with its Haupt Clock Tower is a prominent landmark on campus. The Haupt Building was constructed in 1960. Did you know there is a variety of peach named the Alice Haupt Peach? It was originated by Col. William Walton Haupt of Hays Co., Texas. William Walton Haupt was born 1828 and died 1907. He was an accomplished horticulturist, merchant, and ginner. He had a magnificent estate of 3000 acres and by 1863 had large flocks/herds of Essex hogs, Brahma cattle, Merino sheep, Angora goats, and fine horses. He descended from J. Heinrich Sebastian Haupt of Windesheim. Which two Haupts were 1st cousins and served as officers on opposing sides in the Civil War? They were Brig. General Herman Haupt of Pennsylvania and Col. William Walton Haupt of Texas. Which Haupt/Houpt family lived in Montgomery Co., PA and had a son fight for the South in the Civil War? Henry and Sara (Lightcap) Haupt (Houpt) had a son George A. Houpt (b. 1829) who enlisted in 1862 with the 28th Reg. Virginia Infantry (Bedford, VA). He had moved there prior to the war. George A. Houpt was captured by Union troops at Gettysburg on July 3, 1863 and was imprisoned at Fort Delaware. He was later sent to Point Lookout and later released on Apr. 4, 1864. After this, he would remain in the Montgomery Co., PA area. George A. Houpt is a descendant of Samuel Haupt of Windesheim. Which Haupt family holds the record for having the most children? John Henry Haupt of Savannah, Georgia (1780-1859). The number is 18. By my count, with his first wife Rebecca Lavinder, they had 12 children. Then with his second wife Ann Maria Brindley Weisner, they had 6 children. Twelve of these survived to adulthood. This family appeared to have the finances to live rather well. Did you know that Raymond P. Haupt of Manitowoc County, Wisconsin served in both WWI and WWII? He was born June 8, 1897 and died Jan. 16, 1981. He was the son of August C. Haupt (b. 1857) and grandson of J. C. Ludwig Haupt (b. 1823). Ludwig was born in Hesse, Germany and arrived in 1854. August A. Haupt was born Sept. 13, 1886 in Irnshausen, Hannover, Germany. Shortly thereafter, he emigrated to the US and settled in Twin Falls, Idaho. He would then be sent to fight against his homeland in WWI. What was the most popular Haupt name in 1773? Sebastian and John win with five. There was the immigrant Sebastian (b. 1715); his son Johann Heinrich Sebastian Houpt (b. 1744); his grandson Sebastian (b. 1771 d. 1775). J. H. S. Houpt (b. 1744) would have another son named Sebastian in 1781. Then there was Sebastian son of Johann Nicholas the immigrant. This Sebastian Haupt/Houpt was born 1745. This Sebastian would have a son Sebastian born 1769. All these Sebastians have helped to confuse Haupt researchers over the years. With regard to Nicholas, there was Nicholas the immigrant born 1709 and his son Nicholas (b. 1748). Then there was Nicholas the immigrant (b. 1725); his son Nicholas (b. 1762) and his son Nicholas (b. 1788). Now for all the John Haupts. There was Johannes Haupt the immigrant (b. 1715). There was another immigrant named Johannes Haupt (b. 1734). There was Johannes Haupt of Maine (b. 1759) and John Haupt of Savannah Georgia (b. 1754). Then there was John Houpt (b. 1767) s/o J. H. S. Houpt (b. 1744). As for Henry Haupt. There was the immigrant Henry Haupt (b. 1748) and his son Henry (b. 1777). Savannah, Georgia had two Henry Haupts: there was John Henry Haupt (b. 1780) s/o John, and Henry (b. 1787). There was J. Henry S. Houpt (b. 1744) s/o Sebastian and his son Henry. Then there was Henry s/o Sebastian Houpt (b. 1745) of North Carolina. There was Henry (b. 1785) s/o Nicholas Haupt (b. 1762) of Maryland. Samuel Haupt the immigrant had a son Henry (b. 1764). There was Henry Haupt s/o Johann Philipp Haupt the immigrant and Henry Haupt (b. 1795) s/o Philip Haupt (b. 1758 s/o Samuel) - both Henrys living in Northumberland Co., PA. Also, Henry (b. 1787) s/o Arnold Haupt. Everyone follow? Anyone left out? Make sense? Having fun yet? Did you know that the former Dean of the University of North Carolina (Chapel Hill) Medical School is Dr. Jeffrey Houpt? He is a descendant of the Samuel Haupt line of Montgomery Co., PA. Which elderly Haupt male happened to die a natural death on his deceased mother's birthday? Ray J. Haupt (my father) recently passed away on May 20, 2000 at the age of 71. This date was also the birthdate of his deceased mother, Estella Pensyl Haupt, who was born May 20, 1909. What Haupt descendant served as Sheriff of Dallas County, TX in 1850 and 1852? This same person would also serve as a Colonel in the 31st Texas Calvary in 1862. After his service to the Confederacy, in 1863, he would be murdered. Give up? Trezevant Calhoun Hawpe (b. 1821 d. 1863). Who passed away while riding in the Pullman railroad car named "Irma"? General Herman Haupt suffered heart failure Dec. 14, 1905 just outside Jersey City, New Jersey, while traveling from New York to Philadelphia. Who received a presidential appointment (1890's) to serve on the 3 member Nicaragua Commission to plan the Panama Canal? This person was earlier appointed in 1862 to the US Military Academy by Abraham Lincoln. Did you know that there are 568 individual Haupt entries in the Ellis Island Immigration Records from 1893 to the mid 1920's. The Haupts just kept a coming to America well into the 20th century. Which Houpt/Haupt, while serving as Sheriff, was fatally wounded in a shootout in front of his courthouse? Jacob Davis Houpt "Jake" was fatally wounded on Aug. 20, 1910 in a shootout in front of the County Courthouse in Hot Springs, Garland County, Arkansas. His brother Deputy Sheriff Sidney Roswell Houpt was then appointed Sheriff. Also: Click here. Did you know that there was a Haupt/Houp who perished in America's greatest maritime accident of all time? Was it the Titanic? No. The Steamer Sultana exploded April 27, 1865 just north of Memphis, TN killing 1700+ Union Troops who only days before were paroled from service after the Civil War ended. Paul Haupt (of Baltimore, MD) was awarded the Medal of Honor on March 3, 1870. He was a Corporal in Company L of the 8th US Calvary. His citatation reads for "Gallantry in Action" on July 3, 1869 while serving at Hell Canyon Arizona. He was born in Prussia. This was service during the Indian Wars. At what time on the morning of July 1st, 1863 did General Herman Haupt telegram Union General Meade of Lee's withdrawal from the Harrisburg, PA area and his new approach toward Gettysburg? Answer: 12:45 am. The telegram arrived to Meade by 3:00 am while Meade was still in bed. Click here. Why have historical accounts of the Battle of Gettysburg left Haupt's name out? General Haupt's opinion of his immediate superiors (Generals Meade, McClellan) obviously became known to them and Haupt was consequently "written out" of history. Now you know "the rest of the story". Which Haupt was instrumental in the promotion of the world's first national park (Yellowstone)? It was Herman Haupt, Jr. See Yellowstone National Park Travel Guide of 1883. Which Haupt line involved a grand-daughter of a Haupt immigrant marrying a grandson of a Haupt immigrant? Click here to read about this "All in the Family" Saga. Did you know that a Haupt received two Distinguished Flying Crosses? See: Brig. General Raymond L. Haupt, USAF. By now you have heard about the American Taliban - John Walker Lindh, but have you ever heard of the American Nazi - Herbert Hans Haupt? Did you know that there was a Haupt father (Hans Max Haupt) who was sentenced to life imprisonment (in 1947) for providing shelter to his son, helping his son to get a job, and providing his son with an automobile? For the rest of the story - See: Herbert Hans Haupt. Seeking your MD or PhD? You may want to consult the people on this list. Haupt Academic "Hall of Fame". Which two Haupt Privates served on opposing sides during many of the early battles of the American Revolution? John Haupt of Georgia served with the Rall Regiment (Hessian Troops). Philip Haupt served with the Pennsylvania 2nd Regiment. Both fought at Long Island, White Plains, Trenton, Brandywine. Which Haupt currently serves as the Managing Director for Entertainment at Walt Disney World? John Haupt. It seems Haupts are just about everywhere - including the Magical Kingdom. Thanks John for all you do! Can you name two prominent 19th Century Civil Engineers (one from each side of the Atlantic) whose last name was Haupt? See: Karl Albrecht Haupt of Germany and Herman Haupt of the United States. Which Haupt was a Swedish Master Craftsman during the 1700's and received a royal appointment in 1769? See: Georg Haupt of Stockholm, Sweden. Which Haupt/Houpt had a job delivering mail by horseback? Charles Daniel Houpt was sworn in on Feb. 21, 1890 by William T. Runyan, Postmaster. C.D. Houpt was to deliver mail along route 8827 between Ft. Loudon, Franklin County, PA and McConnellsburg, Fulton County, PA. This distance was about 5 to 8 miles. C.D. Houpt would later work for the railroad and still later as a heating contractor. Which Haupt was among the first people ever to wear a class ring? The class ring tradition began at West Point Military Academy. The first class to celebrate with this tradition was the Class of 1835. The answer is: Brigadier General Herman Haupt who, at just age 18, was a member of the Class of 1835. Clark Gable, the star of "Gone with the Wind", a Haupt? It is true! Click here for more details. Did your family follow the "Olde World" way of naming the children? To learn this system click here. Which Haupt engineered the Great Oil Pipeline and showed the world oil could be transported in this way faster and less expensive than the more conventional way? Answer: Herman Haupt - click here for more information on this accomplishment. Which Haupt climbed to the peak of Mt. Kilimanjaro in Tanzania and in doing so was entered into the Guiness Book of World Records? He also raised $12,000 for a poor Mexican village. Answer: Carl F. Haupt - click here for more information on this kind and able man. Did you know a Haupt served as the US Vice Council in Moscow in 1943? His name was Alden Morgan Haupt. He was born Jan. 18, 1916 in New York, NY and died July 9, 1980 in Illinois the son of Walter Clark Haupt and Mary Alden (Morgan) Haupt. Walter Clark Haupt was born in Oneonta, Otsego, New York (on the Susquahanna River). To my knowledge... There were two American Haupts lost in WWI. Frederick Haupt (Private) of Brooklyn, NY was killed in action. Gilbert C. Haupt (Private) of Trevorton, PA who died of wounds received. Both were in the year 1918. Famed Heart Transplant Surgeon, Dr. Christian Barnard, transplanted the heart from a dying Clive Haupt (age 24) into Dr. Philip Blaiberg (age 50) on Jan. 2, 1968 in Capetown, South Africa. This was Dr. Barnard's 2nd attempt at heart transplant. Dr. Blaiberg would live an additional 19 months with Clive Haupt's heart. In Dr. Barnard's (and the world's) 1st attempt (in Dec. 1967) the patient survived just 18 days. Clive Haupt suffered a stroke on Jan. 1, 1968 while on a beach in Cape Town and had lapsed into a coma. The 1st Violin/Concertmaster of the Buffalo Philharmonic Orchestra is Charles Haupt. Which American Haupt/Houpt served as an Ambulance Driver for the Government of France during WWI? George Knight Houpt. Which father/son (Haupt/Houpt) pair graduated from Yale University? Click here to find out. John Knowles Paine, the first University Organist and Choirmaster at Harvard University (he was also the first Professor of Music in the US), studied music under which Haupt? Carl August Haupt was the Organist and Director at the King's Institute for Church Music in Berlin, Germany. Paine studied under Haupt from 1858 to 1860. Carl August Haupt was born Aug. 28, 1810 in Kuhnau bei Sagen, Schlesien and died July 4, 1891 in Berlin. What kind of mill was Haupt's Mill of Bucks County, PA? It was an oil mill which produced lindseed oil from flax grown nearby. Lindseed oil is used in making wood products such as boats, gun stocks, and furniture. Click here for pictures and information. Which Haupt immigrant line led to 3 prominent Lutheran Theologians during the 19th century? Sebastian Haupt line through his son J. Henry S. Haupt through Jacob Haupt. Click here for more details. Which Haupt survived the plane crash of a B-17 Bomber nicknamed "Crazy Horse" during WWII? It was Charles A. Haupt in 1944. Click here for details. Why did so many German Luftwaffe pilots have the term "Haupt" in front of their name? "Haupt" as a military term in German refers to Major. The term "Hauptmann" refers to Captain. Did you know that 23% (or 516,000) of the Union Troops in the US Civil War were of German descent with 216,000 of those being German born? Records are far more scarce for the Confederate States Army. Assuming similar percentages for the CSA, there were likely another 230,000 of German descent serving with the Confederacy with 100,000 of those being German born. During the American Revolution (1776-1781) there were many Rheinlanders fighting against Hessians. There were even Hessians fighting Hessians. Many thousands of Hessian Troops were employed by the British. Several thousands of the colonists were from the Rheinland and Hessen. Which Haupt was at Appomattox Court House in Virginia during General Lee's surrender to General Grant to end the US Civil War? James Albert Houpe was parolled at Appomattox Court House on Apr. 9, 1865. He served with the Confederacy as a Pvt, Co. C, 4th Reg. NC State Troops. He was from Iredell Co., NC (s/o Abner and Dovey Houpe). He was earlier wounded in the left hand at Seven Pines, VA. He was a descendant of Johann Nicholas Haupt (b. 1709 in Windesheim). Read more about the American Martyr - Michael Haupe. He was a POW in the American Revolution on board the "Old Jersey" British - POW prison ship. Who is known as the "Father of the Triborough Bridge"? The bridge (opened in 1936) is located in New York City and connects the boroughs of Bronx, Queens, and Manhattan. Answer: George August Haupt. Where did the Haupt families reside in 1920? To see where the Haupt families (and all other spelling derivations) lived in the US in 1920 - Click Here. Did you know that 348 Haupts (all surnames) served in the US Civil War? Click here for more details. Which Haupt was presented the Distinguished Service Cross by General Westmoreland in Vietnam? Earl C. Haupt, III - for photo and more information click here. Haupt Officers in the War on Terror. Click Here. Which Haupt was "drummed out" of the Nazi Party in 1938 Germany? It was Dr. Joachim Haupt. Click here for details. Which Haupt just won (Jan. 2006) the World Cup Competition in the Skeleton at Koenigsee, Germany? Click Here. Royal Haupt lines? Just click here. Which Haut (possibly Haupt) was working as the Public Information Officer at Roswell Army Airfield, Roswell, NM on July 9, 1947? This person was the first to (incorrectly) announce the Army was in possession of a "Flying Disc", which sent the world into a frenzy about UFO's. Actually, within three hours, the Army corrected this statement and said it was a broken piece of a weather balloon's instrumentation. Give up? It was 1st Lt. Walter G. Haut of the 309th (Atomic) Bomb Group at Roswell, NM. He was born June 3, 1922 Chicago, IL d. Dec. 15, 2005 in NM. Did you know that Walter Houp aquired land 500 acres of land in Maryland in 1686? This land would later be known as Houpyard. Today the US Capital Building sits in that area/district of Washington, DC known as Houpyard. We are not sure how Walter Houp fits in with the other Haupt - Houpt - Houpe - Houp family lines. Which Haupt was the first to perform as an actor in New York City? Charles Jacob Haupt performed there on January 31, 1833. Click here for more details. His son William Ayres Haupt would continue in this field under the name William A. Mestayer from 1854 to 1896. Did you know that William P. Houpt of Ventnor, NJ met HRH, Prince Charles on two different occasions? The first was in Royal Albert Hall in 1979. The second time was on Nov. 4, 2005 at Charles' visit to the new World War II Memorial in Washington, DC. Dr. William P. Houpt died at the age of 92 on March 27, 2007. During WWII, Houpt was an aerial film photographer/film maker assigned to the Royal Air Force and was stationed in Burma. He would later be a Professor at Westchester University in Pennsylvania and resided in Westtown, PA. Which Haupt raised a sword in defiance and anger (in support of the German King and later HRE Heinrich V) while in St. Peter's Basilica in Rome. Yes. It was in the Pope's presence. It was Heinrich Haupt on Feb. 12, 1111. To learn more, Click on: Heinrich Haupt. Actually, it was the old St. Peter's Basilica. The event was documented in history by Bishop Otto of Freising during the 1100's. This is likely the oldest document existing that mentions the surname Haupt. Which Haupt was warmly congratulated by President Theodore Roosevelt on Aug. 20, 1908? 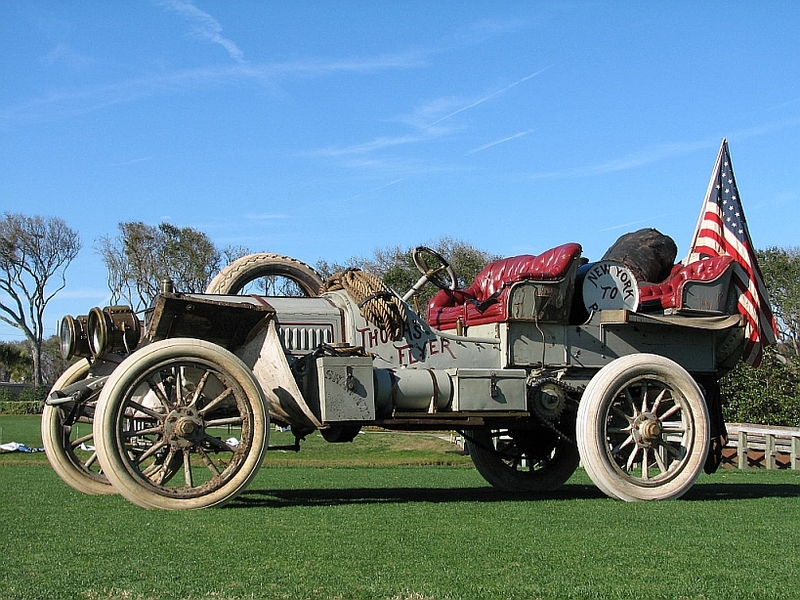 It was Harry Sterling Houpt for his part in the winning of the great New York to Paris automobile race. The winning car was a Thomas Flyer. The drivers were Montague Roberts (started) and George N. Schuster (finished) with George Miller as a mechanic. The fourth person was a New York Times reporter the traveled with them. Harry S. Houpt was the agent and promoter for the Thomas cars in New York City. The Thomas Flyer was built by the E. R. Thomas Motor Company of Buffalo, NY. It was the first time an automobile traveled all the way across the US. Cars were entered into the race by Germany, France, Italy and the US. The path took the racers through Alaska and across the frozen straits and through Russia and into Europe. The race was won in 169 days - 26 days ahead of the German entry. Harry S. Houpt is a descendant of the Johannes Haupt Jr. (b. abt. 1741) line of Northampton, Co., PA through his son Heinrich Haupt of Lehigh Co., PA through his son Philip Houpt (b. 1796) of Luzerne Co. PA. Harry's parents were Missouri B. Houpt (b. 1839) and Sallie (Garringer) Houpt. Harry S. Houpt would later be involved in home construction and real estate in the Pelham, NY area. Harry S. Houpt was born in 1867 and died in 1925.